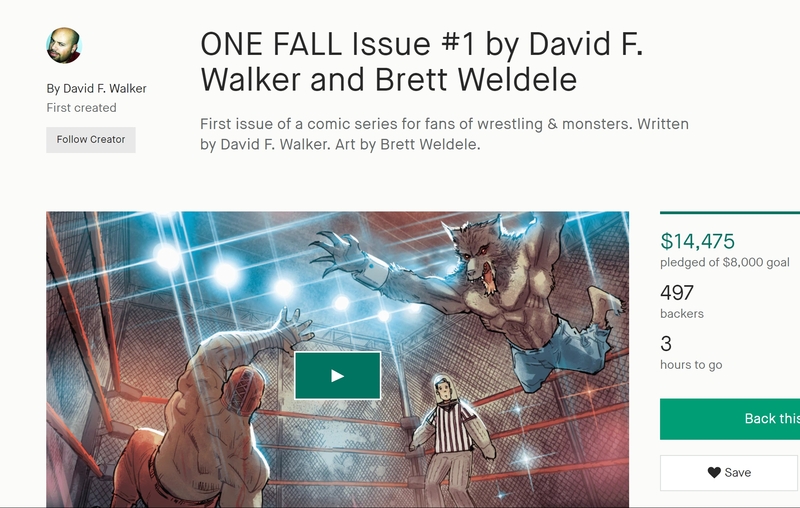 Our congratulations go out to David F. Walker for the successful launch of his kickstarter campaign for Solid Comix's first comic: ONE FALL. If you're a fan of wrestling and/or monsters, you definitely don't won't want to miss this comic. Synopsis: Professional wrestling is real. So are werewolves, vampires, and really greedy promoters that will stop at nothing to make a dollar. Jimmy “Resurrecter” King, is a third generation wrestler dealing with the curse of his family – every time he is killed in the ring, he comes back to life. As if that wasn’t bad enough, now the Resurrecter must fight not only for his life, but also for his family, as he is forced to compete in the deadly Continental Gauntlet. ONE FALL is loaded with action, drama, dark comedy, and tons of wrestling.